Viewing posts with the tag Oral History. Show all posts. We at the Jewish Historical Society of Greater Washington mourn Ambassador Max Kampelman, who passed away January 25 at the age of 92. Kampelman was a leading figure in the Washington community from his arrival here in Washington in 1949. After serving on Senator Hubert Humphrey’s staff, Kampelman joined the law firm that is now Fried, Frank, Harris, Shriver & Jacobson. He remained with the firm until his death. Kampelman is most known for his diplomatic achievements, representing the United States in negotiations with the Soviet Union in Madrid from 1980 to 1983, and in negotiations to reduce nuclear weapons from 1985 to 1989. Along with Assistant Secretary of State for Human Rights and Humanitarian Affairs Richard Schifter, Kampelman insisted on coupling weapons reductions with progress on human rights issues. In addition to being involved internationally, Kampelman took a strong interest in the local community, serving as chairman of, among other organizations, WETA and the Friends of the National Zoo. You can read more about his accomplished life here. One of the biggest honors in my life was conducting an oral history with Ambassador Kampelman in March 2011. The interview was part of our Soviet Jewry movement project—I interviewed both Kampelman and Schifter to get the “view from the top,” to learn what role the movement played in U.S. government decision-making and diplomacy with the Soviet Union. Have you ever wanted to be a fly on the wall where decisions about world affairs are being discussed or the history of our community is being shared? Transcribing oral history recordings at the Jewish Historical Society of Greater Washington can give you a taste of those experiences. Since early February 2012, I've had the opportunity to work on the transcription of an oral history recorded in January 2011 with Ambassador Richard Schifter as part of the Society's Soviet Jewry Project. Schifter is Jewish American lawyer living in the Washington, D.C., area, who served as Assistant Secretary of State for Human Rights and Humanitarian Affairs from 1985 to 1992. He is currently heading the American Jewish International Relations Institute and the Center for Democracy and Reconciliation in Southeastern Europe. He takes the title of Ambassador from his tenure as the Deputy United States Representative in the United Nations Security Council with the rank of Ambassador during the 1980s. Using earphones and the Jewish Historical Society's new software – Express Scribe – is trouble-free. The software includes easily accessed commands for advancing, reversing, adjusting the speed and volume of the speech of the interviewer and interviewee. 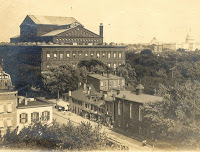 Transcribing a three-hour interview took approximately four 6-hour volunteer days at the Society's offices at 4th and G Streets, NW. Listening to Ambassador Schifter's recounting of his early life in Vienna, Austria, his immigration the United States at the age of 15 in 1938, his army service during World War II, his law school education and his subsequent extensive service within the U.S. Government dealing with human rights issues was the fascinating part of the assignment. More oral histories recorded by the Society are available for transcription by willing volunteers. Please fill out the volunteer form if you're interested! Elsie Heyrman Klumpner has volunteered in the JHSGW archives since 2009. Description: Leo M. Bernstein Archival Collection, which includes biographical materials, correspondence, family history, professional & community recognition, photographs, scrapbooks, and other memorabilia about the life and work of Leo M. Bernstein, D.C. banker, real estate broker, Zionist, civil rights promoter, philanthropist, American history enthusiast and collector. Born in Washington, D.C. in 1915, Leo Bernstein graduated from the city’s Central High School. He received an informal education in real estate while working with his father’s real estate investments. The 1906 deed for his grandfather’s kosher butcher shop and home at 816 Sixth Street, NW, is in the collection. He founded his own real estate company at age 18. Within a year, Bernstein challenged racial and religious covenants, which barred the sale of properties to persons of color or to Jews, selling a house in a “whites only” neighborhood near Howard University to an African-American professor. While working in real estate, Bernstein went to night law school, graduating in 1936 from the Columbus Law School (now Catholic University’s Columbus School of Law). Over the next few decades, Bernstein owned and ran several D.C. banks. Seen here, Bernstein (right) and D.C. Commissioner Gilbert Hahn, Jr., raise the District of Columbia flag at the D.C. National Bank headquarters at 18th & K Streets, NW, in 1971. Bernstein enjoyed collecting historic documents, especially those relating to American presidents; furniture; and other objects, exhibiting some of them in the lobbies of his banks. This interest led him to become involved in historic preservation in the Shenandoah Valley communities of Middletown and Strasburg, Virginia starting in 1960. There, Bernstein helped save and restore several buildings, including the 18th-century Wayside Inn. As documented by itineraries, correspondence, and photographs, Bernstein organized and hosted family reunions and getaway weekends for friends and colleagues there and at other hotels he owned in the region. Among the groups Bernstein welcomed was the Washington Board of Rabbis, which met at the Wayside Inn many times during the 1970s and 1980s. Bernstein’s involvement in Jewish causes and organizations was local, national, and international. These included Adas Israel Congregation, United Jewish Appeal, Hebrew Academy of Greater Washington, American Committee for the Weizmann Institute of Science, Anti-Defamation League, and Yeshiva University. Bernstein served on the board of the Jewish Historical Society for nine years in the 1970s and ‘80s. This 1983 certificate of appreciation from the D.C. Section of the National Council of Jewish Women was awarded for his support on the occasion of NCJW’s 90th birthday in 1983. As a young man, Bernstein was active locally in the cause of Zionism. In a 1999 oral history, Bernstein told of secret meetings attended by community leaders like Abraham Kay, Joe Cherner, and Morris Pollin: “Before Israel was a state, we had many Haganah meetings. We were getting ready to help Jews get into Palestine. They needed money for guns, ammunition and ships. We met at my office at 718 Fifth Street.” One highlight of the collection is a 1948 letter from Joseph Cherner, president of the Louis D. Brandeis District of the Zionist Organization of America, appointing Bernstein chair of the Embassy Building Committee, charged with finding a suitable building for the first Israeli Embassy. Bernstein passed away 2008 at the age of 93. The following year, the Jewish Historical Society started a major archival project funded by the Leo M. Bernstein Family Foundation to organize and preserve this extensive collection of Bernstein’s business and personal papers. The Society completed the project in 2010 and was honored to accept the Leo M. Bernstein Archival Collection when the Foundation formally donated it last month. Do you have material documenting local Jewish individual that you’d like to donate to the Jewish Historical Society’s collection? Please contact us at info@jhsgw.org or (202) 789-0900. Today was one of the coldest days of the year. Yet rarely have I felt so much warmth--even while standing outside for an hour. Forty years ago today--on Human Rights Day, 1970--a small group of activists began a vigil outside the Soviet embassy on 16th Street, NW. They gathered that day to protest verdicts of treason, and subsequent death sentences, against Jewish dissidents in the Soviet Union. For the next 20-plus years, they kept their vigil every day, rain, snow, or shine, hot or cold, until the Soviet Union finally allowed Jews to practice their faith freely and to leave the country. 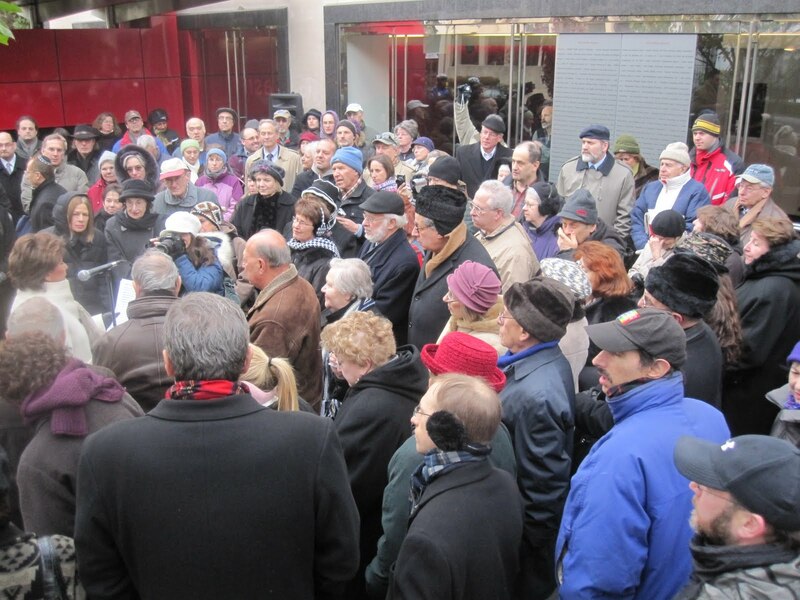 Today, many who had kept that vigil all those years, plus several others, including some of the vigil's beneficiaries--around 125 people in all--gathered again as part of the Society's project to document the Soviet Jewry movement here in Washington. Much has, of course, changed. The embassy across the street now flies the Russian tricolor instead of the Soviet hammer-and-sickle. The building that hosted the vigil then belonged to the International Union of Electrical Workers. It now belongs to the National Council of La Raza--which was gracious enough to host today's commemoration. 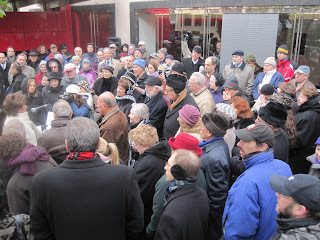 Several speakers who had participated in the vigil talked about their experiences today, including Rabbi David Saperstein of the Religious Action Center of Reform Judaism, Norman Goldstein of the Society's Soviet Jewry project committee, and Pastor John Steinbruck of Luther Place Memorial Church. The president and CEO of the National Council of La Raza, Janet Murguía, noted similarities between the Soviet Jewry movement and struggles for human rights now. A refusenik who had moved to Washington spoke about what the movement meant to him. As someone who was 11 years old when the Soviet Union collapsed, I stood there in awe at these activists' persistence, and their willingness to take a stand for people many of them didn't know. It made me all the more excited to work on the Society's project to document this movement. Already many of the activists have recorded their own oral histories. Stay tuned--in the next couple of years, we plan to create an exhibition and a Web site and/or publication.